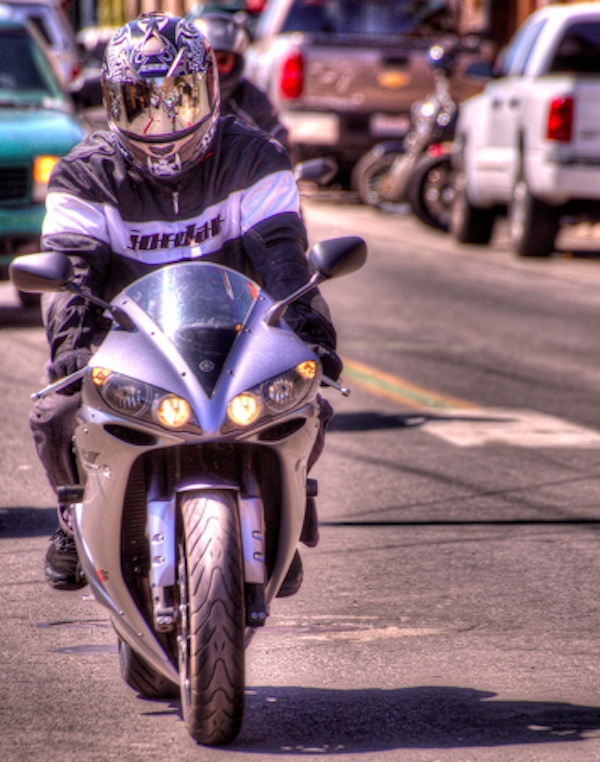 All states have driving laws that stipulate that drivers must share the roadways with motorcyclists. Motorcycle riders have the same rights and must be shown the same courtesy as any other driver on the road. Even so, some motorcyclists do not show the same courtesy given to them. They may believe that their compact motorcycles entitle them to driving in a manner that puts other motorists at risk. When you head out on the highway for vacation, to run errands, or carry out any other part of your daily life, you are encouraged to pay attention to motorcycle riders, know the common risky habits in which some bikers engage, and be ready to act if necessary. While most bikers operate their motorcycles in a safe manner, some motorcyclists like to show off and spook drivers with flamboyant behavior. These individuals may pop wheelies and try to drive on their back tire rather than keep both tires on the ground. Many of these show-off motorcyclists are not stuntmen. They put not only themselves at risk of crashing and being injured, but also you and your family. A motorcyclist’s negligent behavior can cause a complicated car accident with all parties involved on the road. hey are supposed to wait their turn and show respect to other drivers around them. If a biker is in front, to the side, or behind you, it may serve you to expect that individual to weave in and out of traffic lanes. You can be safe by being prepared to stop and give that person space if needed. Many cyclists abide by the speed limit and pose no risk to you and your family. However, some bikers like to speed past the established limits and fly down the highways at neck-breaking speeds. If you see a speeding cyclist coming close to your car, you should be ready to pull over and let that person pass if necessary. Trying to block them by slowing down and preventing that person from passing can cause that cyclist to crash into your car’s back end. You would then be held liable for that cyclist’s injuries and damage to their motorcycle. Some rogue cyclists try to engage other drivers and goad them into racing. They pull up alongside drivers and rev their engines in a bid to invite an impromptu road race. If a cyclist tries to engage you, you are encouraged to ignore the motorcyclist and continue driving as normal. If the motorcyclist becomes threatening, you should call 911 from your cell phone or pull into the nearest public place, such as a gas station or restaurant to get away from that individual. Most motorcycle drivers are safe and law-abiding citizens. However, a small rogue factor exists among bikers. Knowing what behaviors are common when encountering these bikers on the road can keep you and your family safe. Having responsible motorcyclist friends enables Nadine Swayne to offer these tips on how to steer clear of danger. At Steinger, Iscoe & Greene, a Miami car accident lawyer group, they will vigorously fight to protect your rights if you’re involved in a car accident with a negligent biker on the road. Thanks for sharing these tactics for avoiding accidents with motorcyclists. It’s always important to drive defensively and you just never know who’s going to be on the road with you! Especially timely for the Labor Day weekend. I’ve always wanted to ride a motorcycle and when I do I will now remember these safety tips to know what not to do. I saw a guy stand up on his motorcycle while driving on the highway the other day. INSANE! I’ve seen racers and showboats and it scares me for them more than us. Usually young men in their late teens/early 20’s. I’m with you Jenn. I think its the mom in us. Some of these “tricks” make me so nervous on the road because they’re doing them on highways! I always think of crazy driving during the holidays. Be safe! I always get scared when the racers speed by. Motorcycles scare me! I have seen way to many people crash on them. I’m always weary of speeders. I hate when someone is weaving in and out of traffic. So scary! We came upon a motorcycle accident a couple weeks ago (no one was seriously hurt) but the bike was one that we had seen earlier weaving in and out of traffic and going up the shoulder. It goes both ways I see cyclists acting crazing & those driving cars endangering other bikes by not paying attention. I definitely try to stay away from speeders. I have no time or patience for those who can’t follow the rules of the road. There are always a couple motorcycle drivers I see during each summer that do not seem to have a care for their own safety or for others. Motor cycles make me SO nervous — my husband had one for the first year we were married and I’m so glad he sold it! Keeping a safe driving distance is always a smart move. When you start following too close, it’s so easy to get into an accident. I hate driving on the freeway and having to share a lane with motorcycles. They make me extremely nervous, especially when they zip right past me out of nowhere. I get so annoyed when motorcyclists drive like idiots- motorcycles are dangerous enough! I am always particularly careful around them so I don’t do anything to put them in danger, and I expect them to have the same courtesy to try to avoid an accident with me. Motorcycles always make me nervous. I know there are good drivers out there but there are A LOT of bad ones. I would never drive one…EVER! My son is begging for a motorcycle and we are completely against him having one. I think his dad should take him out driving more often, and teach him some lessons specifically on safety issues concerning motorcyclists. These are great tips and ones that I will share with my husband and son. Motorcycles scare the heck out of me! Just the other day we saw a guy speeding and he almost crashed because he couldn’t stop his bike, it was pretty scary. Ugh! I see those stunt guys all the tme here! So scary bc they are risking my life too! I always get upset when I see motorcycle drivers riding in between the lanes. What if a car does not see them doing that illegal move? My son keeps saying that he wants a motorcycle and it scares me to death. We had a motorcycle and rode a lot (we traded it for an ATV when we moved to Montana). As a driver it’s important to know that motorcycles are harder to see on the road than a car. Take an extra look when changing lanes or pulling onto a roadway! I always get nervous when I’m driving near a motorcyclist, especially when they aren’t wearing a helmet! My husband had a Harley when I met him and gave it up on his own. He now wants a sport bike and I am highly against it due to being too nervous! They make me so incredibly nervous that I really just try to stay as far away from them as I can! cant stand motorcycles, makes me so nervous. have only ridden 2 times in my life. both times scared to death. have had many friends severely injured/killed in motorcycle accidents. have a older friend who travels w/ her dog on one. i would never take the chance w/ my dog in one. it is not the bike but the people driving cars and reckless motorcycle riders. They are very nerve-wracking and just had one today just riding in my blind spot for a few miles! So dangerous and silly.. just pass my truck and let me see you! I’m glad this article helped! I’m always super nervous driving next to or behind a motorcycle. helmets aren’t required by law here, so I always worry when I see a motorcyclist driving erratically. My husband had a motorcycle for about a year and then a friend of mine was hit and killed by a driver in a car so I cold not bear to let my husband back on his. I always try to keep a safe driving distance. Things can happen way too fast. You would not believe the racing motorists I have seen lately. Racing in and out of lanes, coming up from behind me and driving so close to my car! Some of these motorcyle drivers drive so dangerous. I stay away from them! Both my dad and brother drive motorcycles. They both have almost been hit. Now when my brother first started, he was young, and did the crazy driving but now he has calmed down and is WAY better than he was before (I think that has something to do with him no longer having a fast bike and switching to a Harley now). When we are following bikes in our car, I always have to remind my husband to give them space (he’s a tailgater) because they can not stop as fast as most think. While I will never make excuses for irresponsible motorcycle riders, drivers are far worse when it comes to endangering riders than the other way around. I live in a state when lane sharing is illegal (and should be) yet drivers continually move into my lane and force me out. In motorcycle courses, new riders are taught to put ” time and space” between themselves and other vehicles, yet drivers tailgate and stop too close to us at traffic lights. Drivers pull out in front of us as if we are invisible. They talk on the phone and text while driving, as well as eat, smoke, fiddle with the radio, and even use laptops while driving. On the freeway! One notices these things more on a bike. Remember, when you are driving a car or van or SUV, you are protected with four sturdy ” walls”. You have air bags and other safety features, as I am sure you are aware. But you are also in control of about a ton of metal, yet have little regard or notice for other legal, licensed, and tagged vehicles on the road with no protection. Now WHO do you think in truly endangered on the road? Hint: It’s NOT drivers.